Where did September go? In the way of all busy months it seems to have disappeared in a flash. September is a watershed month: the official start of spring after the equinox; the budding of leaves and flowers – a genuine renewal of life in nature; a sprinkling of spring rain to aid that renewal; the arrival of seasonal birds, such as the Lesser-striped Swallows; courting and nest-building amongst the birds – and the biting chill of the end of winter coupled with a few teasing days of sunshine warm enough to make us revel in 30°C heat, only to be plunged into the cold again. It is good to hear the cheerful calls of the Bokmakierie and to catch the odd glimpse of Cape Wagtails. It was while I was having tea in the garden (sans camera – of course!) that I observed four Common Waxbills feeding on the fine seed dropped from the feeder above them. As if that wasn’t enough, I looked up to find a single Crowned Hornbill observing me from a nearby tree. It sat in full view for about fifteen minutes before flying off. I mentioned the arrival of the Whiterumped Swifts last month – there a large numbers of them wheeling through the sky now. For me, the true sign of the arrival of spring with a promise of summer ahead is the Lesserstriped Swallow. I have often recorded their triumphs and disasters as far as nest-building and raising their young is concerned. For the first time, a pair of these swallows left a mud nest intact outside our front door. 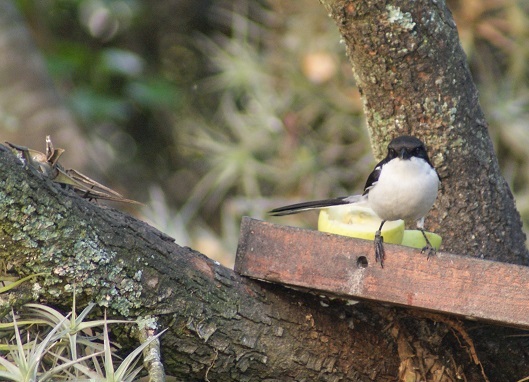 For the first time then, they have been able to twitter and chirp, happy in the knowledge that no nest-building is required after their long journey south. The two of them have wasted no time in re-lining their nest and are already ensconced in it – doubtless having started their family weeks ahead of previous schedules. 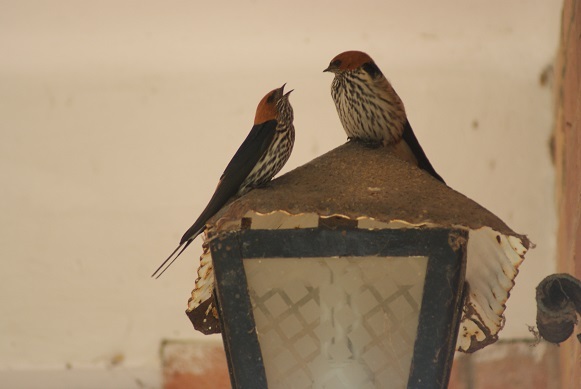 This entry was posted in Birds, Garden and tagged bird list, fiscal shrike, Lesserstriped swallow. Bookmark the permalink. Wow. What a list and interesting post. Just preparing for fall up here. Thanks for sharing. I am pleased that you enjoyed it. Impressive list Anne. I have not noticed swallows here yet – will keep on looking. I agree that September went by in a flash. We have significant rain forecast for tomorrow. Hope it happens and that you get some too. I am glad you have.